I have recently posted about the costly ‘public arts’ that dot the road – but remain unnoticed or do not generate any interest or use for the public … I had posted about the ‘flame thrower’ on the OMR (Old Mahabalipuram Road) that remains near Tidel Park opposite to Thiruvanmiyur Railway Station. In Tamil poetics, thinais ( "genre", "type") is a type of poetical mode or theme. Classical authors recognised two broad categories of thinais. Akam thinais (literally, "the inner genre") consisted of modes used in love poetry, associated with specific aspects of a relationship or specific stages in the development of a relationship. Puram thinais (literally, "the outer genre") consisted of modes that was used to portray and praise the heroic acclaims - of a battle or some other physical achievements. A ‘thinai’ otherwise is descriptive of a complete poetical landscape - a definite time, place, season in which the poem is set - and background elements characteristic of that landscape - including flora and fauna, inhabitants, deities and social organisation. These collectively provide imagery for extended poetic metaphors …. The ancient Tamils had five eco-cultural zones (Ainthinais – 5 thinais) – it was the mountain ecological zone (Kurinji); forestlands (Mullai); fertile plans (Marutham); Coastal lands (Neithal) and desert (Palai)…. 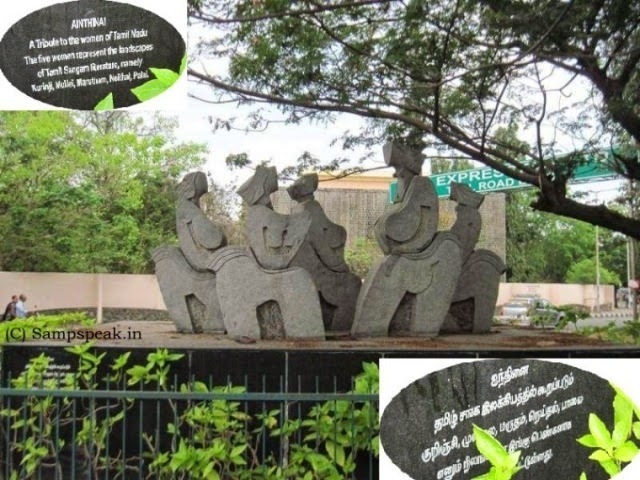 Of the many literary pieces of Sangam literature – ‘Ainthinai Aimpathu’ (ஐந்திணை ஐம்பது) is a work belonging to the ‘Pathinen Kizh kanakku’ anthology of Tamil literature. Ainthinai Aimpathu contains fifty poems written by the poet Kannankoothanaar who lived in Madurai. The poems in this work - deal with the agam (internal) subjects. They are categorised into ten poems for each of the five thinai, or landscape of Sangam poetry (Kurinji; Mullia; Marutham; Neithal & Palai) and describe in detail the situation and emotions specific to each landscape. There is another work ‘Ainthinai Ezhupathu’ (ஐந்திணை எழுபது), also belonging to work belonging to ‘Pathinen Kizh kanakku’ – it is 70 poems by the poet Muvathiyaar. These also deals with agam thinai.